One common misconception is only high budget games are worth playing. There is no denying Horizon, Forza or Breath of the Wild are amazing experiences, though it’s good to explore different experiences. This isn’t always true, as there are many games that are just outright bad, with some finding the sweet spot where it’s so bad it becomes enjoyable. With the Onechanbara series it has always been a combination of pervy elements, simple gameplay and silly plot points, none of which stopped it from being fun. 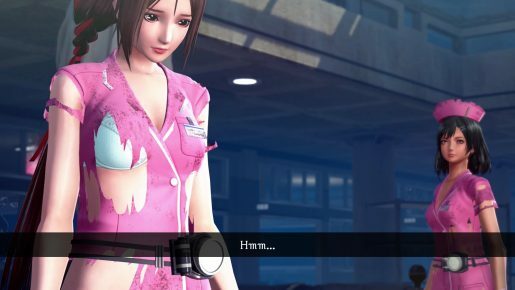 With School Girl/Zombie Hunter taking place in the same universe, will shooting zombies add an exciting new take or does it take away from what made Onechanbara enjoyable? School Girl/Zombie Hunter, unsurprisingly, does not have an interesting story. The basic gist is zombies attack a school, some girls get caught up in the mess and they need to work together to survive and find a way out. While doing this, there are some things going on, like there is a zombie that seems to be causing the attack, with a large part of the story being character interactions. None of these are bad, per se, just don’t expect more than stock archetypes fighting ridiculously stupid enemies. Speaking of which, that is a good way of explaining the AI. Be it the computer controlled allies or enemies, it’s a lot like shooting fish in a barrel or lifeless dummies shooting at the occasional threat. The only time the AI poses a threat is if they spawn next to you, rush or you don’t use the right tools. However, it doesn’t take much to use the right tools. Every girl can be customized a number of ways. This starts with the ability to hold five different weapons, meaning you can bring a rocket, assault rifle, handgun, sniper and shotgun if you want. These weapons can be used to eliminate most threats, though if you don’t like handguns it can be swapped for a second of another type. Every weapon has different attributes and abilities, making some better than others, though you won’t lose because you pick one over another, unless you lack something like a shotgun for tougher enemies and in a lot of ways that is more for efficiency than need, at least on lower difficulty levels. 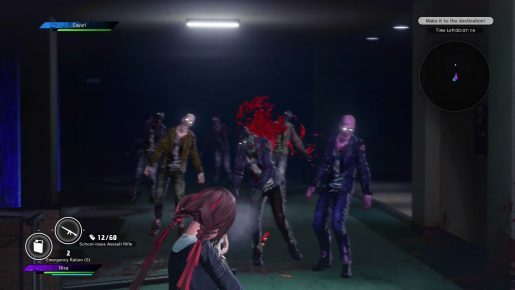 Outside of weapons, every girl has a unique ability, including the ability to find hidden items, revive allies without an item, better stamina use and more. None of these really make a difference, outside of Mayaya’s ability to find hidden items, making it more preference than anything else. Each girl also has their own dedicated melee style, along with various costumes, shoes and even underwear. Each costume can also be damaged during combat, making underwear somewhat important, at least if you care about how it looks during intense combat situations. As for missions, most of them involve killing enemies or going to specific locations. These aren’t too bad, it just doesn’t add much to the experience. This is especially problematic given the gameplay is pretty bad. There doesn’t seem to be a lot of auto aim, unless you have a gun with it and that just makes it feel like there is entirely too much of it, meaning you need to really aim with slow/low ammo weapons to get kills. This isn’t so bad, except it can be hard to anticipate how the enemy will move, given zombies tend to bob more than move at a constant height, making headshots harder to achieve. Thankfully, you have unlimited ammo, with enemies dropping additional weapons and items to aid you on your journey. If that isn’t enough, during more intense situations it isn’t uncommon for there to be slowdowns. Even something simple like hitting three or four enemies with a melee attack will cause lag. This makes an already underwhelming experience even more underwhelming. Thankfully, if you don’t like your AI partners or just want to make everything simpler, there is online co-op. It’s hard to say how populated it will be without friends, as I couldn’t locate another player, though it’s still a nice option to have. 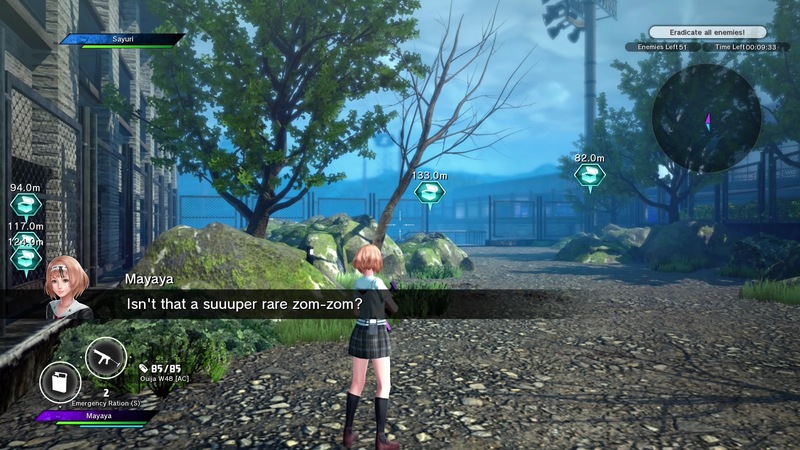 Overall, School Girl/Zombie Hunter gives you about as much depth as you’d expect from the title. 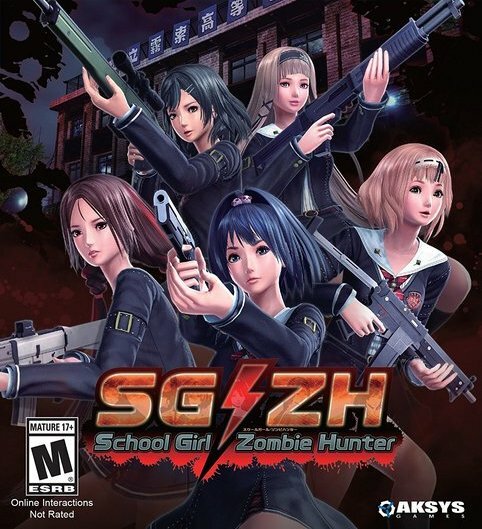 There are school girls and you’re hunting zombies and that is about it. 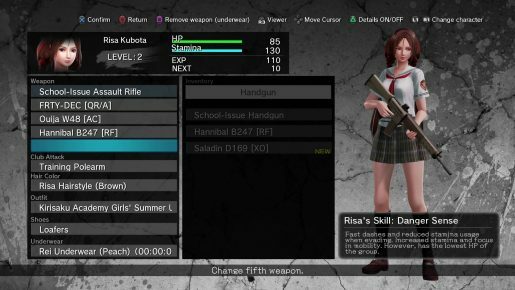 Throw in some of the worst gun controls I’ve seen in a game and AI so dull they couldn’t even make it in a Dynasty Warriors game and you have School Girl/Zombie Hunter. Maybe if you really want to shoot zombies or see what is going on in the Onechanbara universe it is worth looking into, otherwise you’re better off waiting for something else.